WINNER 2011 IACP Judges Choice Cookbook Award (International Association of Culinary Professionals)WINNER 2011 IPPY Gold Award (Independent Publisher Book Awards)Best Italian Cookbook of 2010 - Publisher's WeeklyAmerican chef Jessica Theroux spent a year traveling throughout Italy, cooking and talking with Italian grandmothers, learning their secrets and listening to their stories. The result is a charming and authentic collection of recipes, techniques, anecdotes, and photographs that celebrate the rustic and sustainable culinary traditions of Italy’s most experienced home cooks. 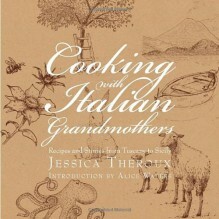 Cooking with Italian Grandmothers features the histories and menus of fifteen grandmothers, each of whom welcomed Ms. Theroux into their kitchens and pantries and shared both their favorite dishes and personal wisdoms. From the dramatic winter shores if Ustica to the blooming hills of Tuscany in spring, readers will journey through Italy’s most divers regions and seasons, to discover the country’s most delectable dishes, from the traditional to the unexpected, and meet the storied women who make them. Part travel diary, part photo essay, part cookbook, Cooking with Italian Grandmothers features over 100 time-honored recipes, from the perfect panna cotta to the classic meat lasagna. Includes:Recipes and wisdom from 12 Italian grandmothers100 classic Italian recipesA number of regional and seasonal menus, complete from appetizer to dessert.Over 150 full color photographs.